Frosty Rhododendron leaves flattened and curled during a winter cold snap. As temperatures have plunged into the 20s (or lower) and we’ve bundled up and watched the snow fall from our heated indoor perches, garden plants are left to fend for themselves day and night under blankets of ice and snow and amid desiccating winter winds. As the soil begins to freeze up and water uptake becomes more difficult for roots and as the dry, cold air above ground begins to sap moisture from plants, rhodies and many other plants take precautions to conserve their moisture. When a plant is faced with environmental stresses that may cause it to release more water than it can take up, which would lead to dieback in the plant, the plant will close its stomata and essentially “shut down the factory” living on reserves until the weather either warms (or cools) to a friendly temperature. Then, the leaves unroll (or in hot weather they may “unwilt”), the stomata open and the factory process of transporting water and photosynthesizing resumes. 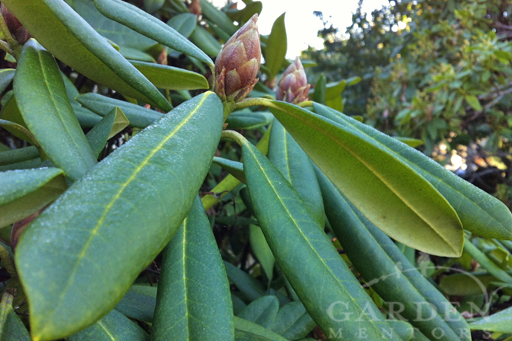 So, don’t worry about those curled up, frozen-looking rhodie leaves. They should be just fine. You may see some frost burn later, but odds are the plant is doing what it needs to do to take care of itself while the weather outside is frightful. By spring, new leaves and beautiful blooms will unfurl. Have any other garden concerns during this cold season? Please write in, and we’ll do our best to help you help your garden during this unusual Pacific Northwest cold snap. Excellent information! I’ve always thought rhododendrons looked like they’re hugging themselves, bracing against the cold. They’re one of my favorite shrubs…and now I know why they do it! Thanks. LOW TEMPS HERE CAUSED RHODOS TO ROLL LEAVES BUT THEN UNFURL WHEN SUN AND TEMP RISE. SHOULD WE WATER THE BUSHES? NO RAIN SINCE 1.5 WEEKS? Emily, site unseen its tough to know what would work in your specific situation. Rhodies do have shallow roots & appreciate a few deep soaks during dry times. Mulching helps too. Good luck! Maria, Site unseen, it’s tough to make a specific recommendation. You might consult with someone local to your area for specific advice. Good luck! Can I hear my evergreen leaves rolling up? Souknds like water running. I love sharing my garden!!! !